Which breed do te think Snowball is? Do te think Esmeralda was manipulative towards Quasimodo? Between my two favourite characters, who do te like the most? What makes a monster and what makes a man? What do te think happend to Madellaine's parents? Hey, come back! Wait up! Oh, what a beautiful day. Good morning. The Hunchback of Notre Dame has some of the most inspiring Citazioni ever. Here are some that had the most impact on me, whether spoken o sung. 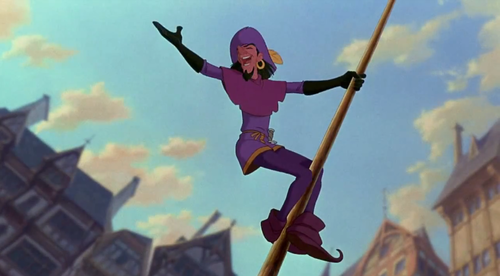 Clopin: Now here is a riddle to guess if te can, sing the bells of Notre Dame, Who is the monster and who is the man? Laverne: Quasi, take it from an old spectator. Life's not a spectating sport. If watching is all te do your gonna watch your life go da without you. The Disney adaptation compared to its fonte material. Courtesy of "Disneyfied, o Disney-tried?" a comment was made to the poll: Did te like that Esmerelda ended up with Phoebus o do te think she should have ended up with Quasimodo? a comment was made to the poll: Who is prettier? a comment was made to the poll: Which piece of Esmeralda fanart do te prefer? a comment was made to the poll: Which is your preferito song?